The high country of north Yosemite, either side of the Tioga Road, is much less visited than Yosemite Valley but has rather more trails. There are plenty of day hikes and many routes that are more suitable for backpacking. The best hikes are centered around Tuolumne Meadows and Tenaya Lake though other places along the road should not be overlooked. Of the shorter routes, five top choices are Glen Aulin, Gaylor Lakes, John Muir Trail to Cathedral Lakes, Lembert Dome and Mono Pass, while the pick of the longer day hikes is probably to Clouds Rest. The descriptions are arranged by trail name rather than destination, so for some, the main feature of interest may be only a short way along the path, while for other sites such as Clouds Rest, the trip might involve two or more different trails. Trails are listed in two sections: north and south of the Tioga Road. The Tuolumne Meadows Hiking Map shows the location of each trail. Other Yosemite trails: Glacier Point Road, Mariposa Grove and Wawona, Yosemite Valley. Bennettsville Mine 1.4 100 Just east of the Yosemite National Park boundary near Tioga Pass, a short, easy but seldom hiked trail crosses lightly wooded, high elevation terrain, past a few ponds, to the site of the old gold mining settlement of Bennettsville. Relics include spoil heaps, a sealed tunnel and several pieces of iron equipment, plus two replica cabins. Dog Lake and Lembert Dome 2 850 One of two routes to Dog Lake begins from the start of the side road to Soda Springs. The path climbs quite steeply through thick pine forest alongside the lake's outlet stream, beneath the sheer west face of Lembert Dome then levels out somewhat as it reaches a junction. The right fork heads east, around the north face of the dome and eventually back to an alternative trailhead on the main road; there is no official trail to the top of Lembert Dome but it can be reached by scrambling up the less steep northern slopes. The bare granite summit has excellent, 360° views over Tuolumne Meadows and its surrounding peaks. At the junction, the Dog Lake Trail continues for 0.4 miles to another intersection; east is a spur trail to the lake, north the main path continues to Young Lakes after 4.5 more miles. Gaylor Lakes Starting right next to the eastern park entrance, the easy trail to Middle & Upper Gaylor Lakes climbs a hillside, passing through pine trees at first then grassland, crosses a ridge to the first lake and continues a short distance north to the second. Just to the west (off trail) are the two Granite Lakes while half a mile further on the path are the remains of Great Sierra Mine, an unsuccessful silver operation started in the 1880s. Various shafts and stone cabins can still be seen. Glen Aulin The trail to the Glen Aulin backcountry campsite and beyond is one of the main routes into the northern wilderness of Yosemite National Park. It begins in the middle of Tuolumne Meadows, at the end of the short side road to Soda Springs, and follows the Tuolumne River downstream, passing several cascades and waterfalls. The first few miles to White Cascade and 100 foot Tuolumne Falls are good for a day hike, across typical high Sierra scenery of granite, meadows and woodland. Near the campsite are two junctions; southwest is the Murphy Creek Trail, north the Cold Canyon Trail and west is the Tuolumne River Trail. Harden Lake 2.9 300 The White Wolf Campground is the start point for an easy trail along an old road through thick woodland to Harden Lake, which is also surrounded by trees, and is not particularly scenic. Not far beyond the lake, the trail descends into the Grand Canyon of the Tuolumne, leading eventually to Glen Aulin. Lower Gaylor Lake 2.5 800 Another trail to the Gaylor Lakes starts 4 miles beyond the main route, just west of Dana Meadows - this less-used path leads into the hills alongside the lake outlet stream, ending by the southern shore of Lower Gaylor Lake after 2.5 miles. The others can then be by reached a short walk cross-country. All this area is surrounded by high granite peaks and is very scenic. Lukens Lake This easy but not too interesting path leads northwards from a trailhead along the Tioga Road, across a saddle then on to Lukens Lake and its adjoining meadow (good for wildflowers in summer). After the lake, the route is down a wooded hillside, along the Middle Tuolumne River for a while past two junctions (to Ten Lakes and White Wolf Campground), across hilly land and finally a partial descent into the Grand Canyon of the Tuolumne River, where it meets the Pate Valley Trail. Most of the land in this part of the park is wooded and gently hilly, without any high granite peaks or deep valleys. May Lake 1.2 300 The short path to May Lake and the High Sierra Camp located nearby begins from the end of a 1.7 mile side road a few miles east of Porcupine Flat, and ascends through woods and over granite slopes to the east shore. Past the lake, the path (now the Ten Lakes Trail) goes on towards Tuolumne Peak and Polly Dome Lakes. Murphy Creek The trailhead for the lightly used path along Murphy Creek is on the Tioga Road next to Tenaya Lake. The route is up a forested valley, over open granite slopes, through more woodland along the creek and into a flat area with various small ponds and lakes beneath 9,806 foot Polly Dome, from where a short hiker-made trail crosses to the shore of the main lake. Higher peaks to the west (Tuolumne Peak, Mt Hoffmann) make the setting quite dramatic. The trail continues north, past one junction, across the valley of Cathedral Creek and alongside McGee Lake to the Glen Aulin Campsite. Pate Valley This long trail into the north Yosemite Wilderness begins officially at Harden Lake, though the hike starts at the White Wolf Campground, 2.5 miles to the south along the Tioga Road, from where an old track leads to the lake. A steady descent into the Grand Canyon of the Tuolumne River is followed by a flatter stretch along the valley floor, to a bridge over the river and a junction with a path from Glen Aulin. On the far side is an equally steep ascent past Table Lake to Pleasant Valley. Ten Lakes The Ten Lakes Trail is a long route through varied scenery, running from the Tioga Road next to Yosemite Creek, up a valley and over a ridge into a basin with many lakes and ponds, across another canyon, around the north side of Tuolumne Peak then back south to May Lake. For a few miles either side of the lakes, the path has views into the Grand Canyon of the Tuolumne River. 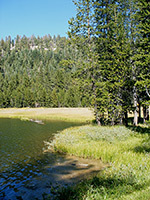 Although the Ten Lakes and nearby Grant Lakes are reachable on a day hike (both around 7 miles from the road), none of the trail receives much use, despite the pristine surroundings. Tuolumne Grove 1.1 400 Although much smaller than the famous giant sequoias at Mariposa, the Tuolumne Grove is less visited and a lot more peaceful. The trail descends slowly along an old road to the trees, which include a former drive-through sequoia, now deceased. Tuolumne River From the Glen Aulin campsite, the Tuolumne River Trail crosses the Glen Aulin meadow then starts to descend more steeply, past other waterfalls and into the Grand Canyon, where the trees fade away and the gradient becomes less steep. The next junction is not for many miles, where the path meets the Pate Valley Trail; bearing left, this follows the river for 2 miles then begins a long climb out of the canyon, past Harden Lake and back to a paved road at the White Wolf campsite. Young Lakes 5 1,280 This fairly well used path begins about a mile down the trail to Glen Aulin; it branches away north and is little changing for most of its length, passing through thick pine woodland with occasional granite outcrops, ending at the western shore of one of the three Young Lakes, in a basin beneath Ragged Peak. This place can also be reached by the Dog Lake Trail. Clouds Rest Clouds Rest is a rounded granite summit, 1,090 feet higher than the more well known Half Dome but offering similar, if not better, views of Yosemite Valley and countless square miles of the backcountry. 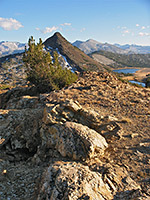 The peak can be approached either from the south, starting in the valley, or from the north beginning along the Tioga Road - the southern end of the 5 mile Clouds Rest Trail, which leads to the summit, branches off the John Muir Trail, while the northern terminus is at a junction with the Forsyth Trail. The northern route is shorter (7 miles vs 9.5 miles) and has much less elevation gain (2,300 ft vs 5,900 ft). The first 5 miles is along the Sunrise and Forsyth Trails while the final 2 miles to the top (the Clouds Rest Trail) is up to then along a ridge, ending with an off-trail scramble to the actual summit. 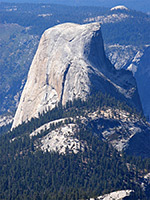 Although the east side of the peak has a partial covering of grass and trees, the west side, like Half Dome, is sheer granite, dropping 4,000 feet down to Tenaya Creek. Elizabeth Lake 2.4 850 One of few trails that does not link with any others, this begins at the Tuolumne Meadows Campground and follows the east side of Unicorn Creek through woodland to Elizabeth Lake, situated beneath high peaks of the Cathedral Range. The glacial lake is ringed by grassy meadows and is a good destination for a half day hike. Forsyth Forsyth is a link path between the Sunrise Trail and the John Muir Trail, used to reach Clouds Rest and forming part of one possible route from Yosemite Valley to Tuolumne Meadows. From the north end the path descends a little into thin woodland then is level overall as it passes two small ponds and crosses several creeks, reaching a junction with the Clouds Rest Trail. From here the downwards gradient becomes steeper as the path enters the valley of Sunrise Creek, where it joins the John Muir Trail. John Muir (west) The westward part of the John Muir Trail can be accessed from the main road through Tuolumne Meadows just west of the bridge over Budd Creek (shuttle stop no. 7), about half a mile from the visitor center. If walking the whole trail, this point is 3 miles west of the ranger station. The path climbs the wooded hillside above Budd Creek for half a mile then turns away to the west, skirting the high cliffs beneath Cathedral Peak. The trees thin out as the path reaches a junction with a short spur that drops to Lower Cathedral Lake, one of the most popular destinations on this part of the park on account of its spectacular setting, beneath smooth granite slopes and peaks. 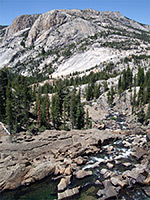 The main trail soon approaches the upper lake, reaches a high point at Cathedral Pass then begins a long descent towards Yosemite Valley (see Yosemite Valley Hiking). John Muir (east) From the Tuolumne Meadows Ranger Station, the eastwards section of the John Muir Trail is nearly level for many miles as it follows the edge of the woodland beside Lyell Fork of the Tuolumne River and enters Lyell Canyon, where the route turns south and crosses generally more open ground of meadows and marshland. The path fords two significant tributary streams on the south/west side (Rafferty Creek and Ireland Creek); both have a trail that climbs into the Cathedral Range towards Vogelsang Lake. The John Muir Trail starts to ascend steeply at the far end of Lyell Canyon after about 10 miles, soon rising above the treeline and to the granite slopes around 11,050 foot Donahue Pass. Lyell Canyon is not a major dayhike destination; this path is used mostly by long distance walkers. Mono Pass 4 1,000 Beginning at 9,680 feet from a parking area near Dana Meadows, 1.4 miles inside the east edge of the national park, the easy trail to Mono Pass encounters patches of woodland, marshy meadows and several streams as it leads southeast up Parker Pass Creek towards some of the highest peaks in the Sierra Nevada. 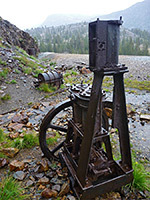 The last mile ascends moderately steeply, above the treeline, to the pass, near which are several small lakes, some old mine workings and 5 reconstructed cabins. On the far side, past the park boundary, the route descends close to Upper & Lower Sardine Lake into the Ansel Adams Wilderness. Before Mono Pass are two junctions, one for a 2 mile spur trail to Spillway Lake, the second another long backcountry path to Parker Pass and beyond. Mount Dana 3 3,100 The steep trail to the summit of Mount Dana, Yosemite's second highest peak, is unofficial but well used and easy to follow, at least as far as the start of the scree and boulders that cover the upper 1,000 feet. From the top stretches a stupendous view right across the Sierras, from California's Central Valley to distant mountain ranges in Nevada. The hike begins right next to the national park entrance station along the Tioga Road. Rafferty Creek 5.8 1,400 The Rafferty Creek Trail to Vogelsang High Sierra Camp starts along the John Muir Trail, at a point reachable from several locations in Tuolumne Meadows after a walk of around 2 miles. The path heads due south along Rafferty Creek towards the high peaks of the Cathedral Range, passing through sparse forest with open meadows, over 9,992 foot Tuolumne Pass then a short distance further to the campsite, where three trails continue. Northeast is to Fletcher Lake, Evelyn Lake, Ireland Creek and back to the John Muir Trail; south is to Vogelsang Peak and the Upper Yosemite River valley; southwest is an alternative route to the valley via Fletcher Creek. Sunrise One of the most used paths along the Tioga Road, the Sunrise Trail links with several other routes to reach many places in the backcountry. 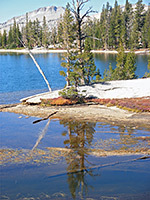 The path begins at the west end of Tenaya Lake and for 1.5 miles ascends quite gently through patches of woodland, crossing several creeks, before a steeper ascent to a junction with the Forsyth Trail which in turn leads to Clouds Rest. Turning east, the Sunrise Trail soon reaches the three Sunrise Lakes, surrounded by large areas of smooth granite slopes, then continues to a junction with the John Muir Trail beside the Sunrise High Sierra Camp.